the scent of green bananas: name that fruit! : figs. Posted by santos. This entry was posted on 20071208 at 8:12 PM You can skip to the end and leave a response. What a great post! I have a Fig tree here in Virginia, near Washington DC. I love it, it's grown to over 15 feet at this point. My sister-in-law's family has a gigantic fig tree that drapes all over their deck. I remember when her dad first planted it - he would bundle it up in a blanket for the winter :) Now it's growing like a weed and I have a feeling they hardly make a dent in its yield. I know if I asked they'd let me come pick some, but I'm not keen on eating fresh figs and don't really have a recipe in mind (I love fig jam - does that use fresh figs?). Anyway, can't wait to see what you come up with! I got excited the last two years when our fig tree in the backyard bore so many fruits, but the birds got them all! We even put up a net and the birdies got through still. Next year I might resort to BB gun! hello HHKS! i've been told my tree variety is brown turkey, which grows well in warmer climates. i love all the different varieties. do you know what kind you have? hi cathy! i made a very nice fig jelly/jam once with fresh figs, port wine and meyer lemons. it was sooo good. i have a bunch of suggestions now, and i definitely have to try that ice cream you suggested. miss pim, before you go for the gun i've heard that wrapping the fruit loosely in newspaper might help. although if you have a ton of fruit, the bb gun might be the easier option! what a treat - a ripe, fragrant fig, eaten within minutes of picking - is fit for the gods all on it's own. a fig 30 minutes old is good - but a day-old fig has lost most of it's sparkle. 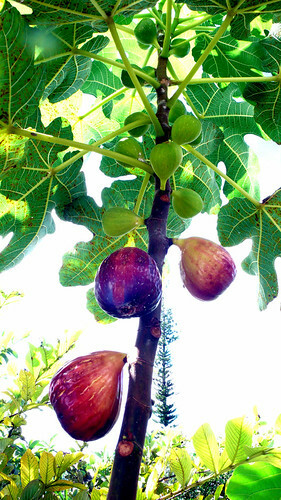 sadly, most of us, most of the time, eat figs that are several days from the tree. hello hayden! this is the first "crop" of which to speak; supposedly the fruit gets better as the years go on. i'm looking forward to it. you have a fig tree!! i just made a fig/goat cheese/pecan concoction with honey last weekend and i had to use dried figs because i didn't think there were any fresh figs on island. i am so jealous. hello mimi! i bought my cutting around this time last year at the guam grower's market in the kmart parking lot...you know, all those tents that take up valuable parking spaces on weekends? ;) anyway, you should find a tree there. i don't remember the name of the grower, but you might want to ask if you don't see one. once my tree gets established, i'd be happy to give you a cutting--it's super simple to grow. i can't remember the name of the group--something like guam plant association--but it's all plants and gardening stuff, no produce. still, i've found some gems in there. last summer i picked up some gorgeous hydrangeas...although i managed to kill them. oops. also, department of agriculture has a nursery; i haven't gone there in a loooonnnnng time but i've heard they've got an organic farm going, too. they won't have figs, i think, but some good citrus and i picked up a pomegranate tree from there awhile back. I really wish I had space for a fig tree, but I live in an apartment so I don't have a yard. I usually buy dates Holy Food Imports and they still taste as fresh as if they came off the tree.